I do not entirely understand your, and your student’s, points about how one feels in response to “interminable post-gym selfies.” I follow you on the Instagrams. You are reasonably aware you are a stunning specimen – and you’re a philosopher. I’ve told my friends that if anyone doesn’t find you beautiful, they aren’t gay. 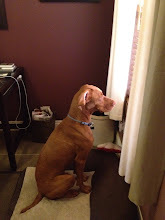 Then there are the photos of your perfectly nice bf unit and Viszla. Also, you will surely admit your typography is unreadable. My point—but maybe not my student's—was that tying ourselves too much to any one goal that we wish to achieve can make us unhappy both in the desire leading up to the achievement and the fear that we will lose it once we have it. There is also another issue about the way that valuing ourselves comparatively (something we all do to one degree or another) can make us less happy than learning to value ourselves and our lives as they are; if I'm always comparing myself to others, there are always others doing better. I agree about the font size issue, but that's something that has been buggy on blogger for the last week or so and I can't quite figure out how to fix it. As for the login options, those are the only two available to me other than allowing anonymous comments and my previous experience with that hasn't been great.